ABSTRACT. Monocyte chemoattractant protein (MCP)-1, also termed monocyte chemotactic and activating factor (MCAF)/CCL2, plays an important role in progressive organ fibrosis. It was hypothesized that MCP-1, through its cognate receptor, CCR2, regulates the pathogenesis and is therapeutically of importance for renal fibrosis. To achieve this goal, the therapeutic efficacy and efficiency in renal fibrosis induced by a unilateral ureteral obstruction nephropathy model in mice by the blockade of MCP-1/CCR2 signaling was studied. The delivery of N-terminal deletion mutant of the human MCP-1 gene, 7ND, into a skeletal muscle ameliorated renal fibrosis by resulting in decrease in the deposit of type I collagen and in reduced expression of TGF-β. Concomitantly, gene transfer of 7ND reduced the cell infiltration, most of which were CCR2-positive macrophages, followed by the decrease in MCP-1 expression in the diseased kidneys. These observations suggest that MCP-1 through CCR2 signaling is responsible for Mφ recruitment, which augments downstream events, resulting in renal fibrosis. Moreover, these findings imply that gene therapy against MCP-1/CCR2 signaling via the mutant gene transferred strategy may serve a beneficial therapeutic application for renal fibrosis. Monocyte chemoattractant protein (MCP)-1, also termed monocyte chemotactic and activating factor (MCAF)/CCL2, is secreted by various somatic cells, including fibroblasts, astrocytes, mesangial cells, tubular epithelial cells and infiltrated inflammatory cells (1,2⇓). MCP-1 plays an important role in the pathogenesis of crescentic formation and progressive tubulointerstitial lesions via recruitment and activation of monocytes/macrophages (Mφ) in experimental glomerulonephritis models (3–5⇓⇓) and human nephritis (6–8⇓⇓). MCP-1 is also responsible for tubulointerstitial lesions for human diabetic nephropathy (9). Recent studies revealed that progressive organ fibrosis correlates with MCP-1 expression and accumulation of CCR2-positive leukocytes in lungs (10) and kidneys (11), which suggests that MCP-1-dependent processes commonly contribute to the progressive organ fibrosis. Accumulating data suggest MCP-1/CCR2 signaling as the potential therapeutic targets in various inflammatory diseases. The blockade of MCP-1/CCR2 signaling achieved the attenuation of bronchiolitis obliterans syndrome both in CCR2-deficient mice and anti-MCP-1 neutralizing antibody-treated mice (12). We established that anti-MCP-1 antibodies ameliorated glomerulosclerosis and interstitial fibrosis in a rat crescentic glomerulonephritis model (3). In addition, a novel class of CCR2 chemokine receptor antagonists has been developed (13,14⇓). However, in vivo effects of CCR2 antagonists remained investigated. Furthermore, N-terminal deletion mutant of the human MCP-1 gene (7ND) delivered into a skeletal muscle dramatically inhibited vascular remodeling (15) and atherosclerosis (16) in mice. It is worth noting that gene transfer by electoroporation in vivo has been demonstrated to be more effective for introducing DNA such as 7ND into muscle when compared with simple DNA injection into the sites (17). Therefore, gene transfer of 7ND with electroporation might be appealing as the therapeutic tool for the blockade of MCP-1/CCR2 signaling. In this study, we hypothesized that the blockade of MCP-1 through CCR2 signaling is therapeutically of importance for renal fibrosis. To address this issue, we examined the therapeutic application in renal fibrosis induced by a unilateral ureteral obstruction (UUO) nephropathy model in mice by the intramuscular electroporated transfer of 7ND. We describe here that the delivery of the DNA encoding N-terminal deletion mutated of human MCP-1 reduced renal fibrosis. These results suggest that MCP-1, through CCR2 signaling, is responsible for the progression of renal fibrosis, and that blockade of MCP-1/CCR2 signaling by the mutant gene transferred strategy could be a novel therapeutic approach for treating progressive renal fibrosis. Inbred male Balb/c mice, aged 8 wk, were obtained from Charles River Japan (Atsugi, Kanagawa, Japan). All procedures used in the animal experiments complied with the standards set out in the guideline for the care and use of laboratory animals in Takara-machi Campus of Kanazawa University. Human 7ND cDNA with an epitope tag FLAG in the carboxyl-terminal was constructed by recombinant PCR by use of a wild-type human MCP-1 cDNA (a gift of Dr. Teizo Yoshimura, NCI, Frederick, MD) as template and cloned into the BamH1 (5′) and Nod1 (3′) sites of the pCDNA3 expression vector plasmid as described previously (15,16⇓). To assess the inhibition of MCP-1/CCR2 signaling, 50 μg plasmid containing 7ND or empty plasmid as a negative control was administered into the femoral muscle with a disposable insulin syringe with a 27-gauge needle. To enhance expression, mice received electroporation at the injected sites immediately after injection (17). A pair of electrode pads was inserted onto the muscle to encompass the DNA administration sites, and electrical pulses were delivered six times (100 V, 50-ms pulse) with an electrical pulse generator (ECM830; BTX, San Diego, CA). Seven days after the gene transfer of 7ND, a UUO model was conducted. For pathologic examination, the obstructed kidneys were harvested from UUO animals 4, 7, and 14 d after ureteral ligation (n = 6 for each group at each time point). Normal mice aged 8 wk were used as negative controls. FLAG Western blot detection kit (Stratagene, La Jolla, CA) was used to detect FLAG-conjugated 7ND in the serum (18). In brief, 7ND in the serum SDS-PAGE was carried out with SDS-PAGE gels and SDS running buffer, and then the protein bands from the gels were electroblotted onto nitrocellulose membranes. The serum levels of 7ND were evaluated by a quantitative sandwich enzyme immunoassay for human MCP-1 (R&D Systems, Minneapolis, MN). This assay dose not cross-react with other chemokines, including murine MCP-1. The expression of 7ND protein with FLAG in skeletal muscle and diseased kidneys was detected by the immunohistochemical method with anti-FLAG M2 antibody (Sigma-Aldrich, Munich, Germany) 14 d after a UUO model (18). To determine the local presence of 7ND with CCR2, a dual staining was evaluated (19). Sections were first incubated with goat anti-mouse CCR2 antibodies (sc-6228; Santa Cruz Biotechnology, Santa Cruz, CA) overnight. After rinsing in PBS, anti-FLAG M2 antibody was added and the sections incubated overnight. CCR2-positive cells were visualized with FITC, and FLAG staining for 7ND protein with Cy3. Adobe Photoshop was used for image handling, and the three-color channels were handled separately. One portion of the renal tissue was fixed in 10% buffered formalin (pH 7.2), embedded in paraffin, cut at 4 μm, stained with hematoxylin and eosin, periodic acid-Schiff (PAS) reagent, or Mallory-Azan, and observed under a light microscope. Two independent observers with no prior knowledge of the experimental design evaluated each section. Mean interstitial fibrotic area, expressed as blue in Mallory-Azan staining, was evaluated from more than ten randomly chosen fields under high-power magnification (×400) and expressed as a percentage of the field by using Mac Scope version 6.02 (Mitani Shoji, Fukui, Japan). In addition, interstitial cells were counted in 20 randomly selected high-power fields (×400). The presence of MCP-1 and TGF-β1 was demonstrated immunohistochemically on formalin-fixed, paraffin-embedded renal tissue specimens by using the indirect avidin-biotinylated peroxidase complex method with rabbit anti-murine MCP-1 polyclonal antibodies and rabbit anti-murine TGF-β1 polyclonal antibodies (clone: sc-146; Santa Cruz Biotechnology). The antigen was retrieved with Target Retrieval Solution (DAKO, Glostrup, Denmark) (19). To evaluate the specificity of these antibodies, we stained tissue specimens with IgG obtained from normal rabbits or with antibodies for MCP-1 and TGF-β1 absorbed with the excess amount of each molecule. The presence of type I collagen was also demonstrated immunohistochemically on paraffin-embedded renal tissue with rabbit anti-murine type I collagen polyclonal antibodies (Chemicon International, Temecula, CA). The positive area of MCP-1, TGF-β1, and type I collagen was evaluated from more than ten randomly chosen fields and expressed as a percentage of the field by using Mac Scope version 6.02. The other portion of fresh renal tissue, embedded in OCT compound and snap frozen in n-hexane cooled with a mixture of dry ice and acetone, was cut at 6 μm on a cryostat (Tissue-Tek Systems; Miles, Naperville, IL). To identify CCR2-positive cells, dual-labeled immunofluorescence immunohistochemistry was performed (19). Briefly, sections were first incubated with goat anti-mouse CCR2 antibodies (clone: sc-7225; Santa Cruz Biotechnology) overnight. After rinsing in PBS, the rat anti-mouse F4/80 antibodies was added and the sections incubated overnight. CCR2 was visualized incubated sections for 120 min with fluorescein isothianate (FITC)-conjugated donkey anti-goat IgG antibodies (1:200; Jackson Immunoresearch Laboratory, West Grove, PA). After rinsing, sections were incubated for 120 min with Cy3-conjugated donkey anti-rat IgG antibodies (1:200; Jackson Immunoresearch Laboratory) to visualize F4/80. The number of interstitial infiltrated F4/80-positive macrophages or dual positive cells for CCR2 and F4/80 was counted in 20 randomly selected high-power fields (×400). To determine transcripts of MCP-1 and TGF-β, total RNA was extracted from the whole kidneys. cDNA was reverse-transcribed from 6 μg total RNA, combined from six mice in each group (1 μg RNA per a mouse), by using a SuperScript II RNase H− Reverse Transcriptase (Invitrogen, Carlsbad, CA). Reverse transcription was performed with the following parameters: 10 min at 25°C, 30 min at 48°C, and 5 min at 95°C. For all PCR experiments, the LightCycler (Roche Diagnostics, Basel, Switzerland) was used. In quantitative RT-PCR for murine MCP-1 (primers, foward: 5′-ACTGAAGCCAGCTCTCTCTTCCTC-3′ and reverse: 5′-TTCCTTCTTGGGGTCAGCACAGAC-3′), 1 μg of cDNA prepared above described and carried out by SYBR Green I format with LightCycler Fast Start DNA Master SYBR Green I (Roche Diagnostics). Transcripts of murine TGF-β1 and GAPDH were determined by using primers and hybridization probe kit (Nihon Gene Research Labs, Sendai, Japan). The reactions for MCP-1 were incubated at 95°C for 10 min followed by 40 cycles of 15 s at 95°C, 10 s at 55°C, and 20 s at 72°C. The reactions for TGF-β1 were incubated at 95°C for 10 min followed by 40 cycles of 10 s at 95°C, 15 s at 62°C, and 11 s at 72°C. mRNA expression of MCP-1 and TGF-β1 in each sample was finally described after correction with GAPDH expression. No PCR product was detected in the real-time PCR procedure without reverse transcription, indicating that the contamination of genomic DNA was negligible. Gels of the PCR products after quantification of MCP-1, TGF-β1, or GAPDH by real-time RT-PCR showed a single band (270, 293, and 230 bp, respectively) with the expected size (data not shown). To determine transcripts of type I collagen, total RNA was also extracted from the whole kidneys from six mice in each group 4, 7, and 14 d after ureteral ligation, to perform RT-PCR. cDNA was reverse-transcriped from 6 μg total RNA, combined from six mice in each group (1 μg RNA per a mouse), by using a RT-PCR kit (Takara Shuzo, Tokyo, Japan). The cDNA product was amplified by PCR. Primers for type I collagen (5′-TCGTGACCGTGACCTTGCG-3′ [sense]; 5′-GGATGAGTCGGCAGACACGGA-3′ [antisense]) (20) were used to detect type I collagen transcripts. The housekeeping gene GAPDH was used for PCR controls. Ten microliters of PCR products were run on 2.0% agarose gel and stained with ethidium bromide, gene-specific bands were visualized under ultraviolet light. The quantities of target cDNA were analyzed by NIH image. Scanner analysis of photographs of the DNA-stained agarose gels was evaluated by the band intensity comparison of GAPDH expression versus type I collagen expression in computer image analysis. Renal tissue was excised in 5-mm cubes and dried for 16 h at 120°C. Hydroxyproline (HP) contents were measured according to a previous study (21). HP amount was calculated by comparison to standards and the data were expressed as the amount per renal tissue (μg/mg tissue). Age-matched normal mice (n = 5) were used as controls. Values are expressed as mean ± SEM. Statistical significance was analyzed by t test, ANOVA, and Kruskal-Wallis test for the analyses of nonparametric and parametric data. P < 0.05 was considered to be statistically significant. High levels of the local production of 7ND at the injected skeletal muscle were confirmed 14 d after a UUO model (data not shown). In contrast, a carboxyl-terminal FLAG epitope-tagged 7ND gene was not detected in mice receiving an empty vector (data not shown). FLAG-conjugated 7ND in the circulation was detected by Western blot test by the time the animal was killed (Figure 1a). Serum levels of 7ND detected as human MCP-1 remained increased during the experiment periods (Figure 1b). These results indicate that 7ND protein was efficiently expressed in sera during a whole course of the experiment. In addition, 7ND protein could be detected in diseased kidneys in 7ND-treated mice, especially in the infiltrating cells 14 d after ureteral ligation (Figure 1c), whereas 7ND was not detected in untreated mice (data not shown). Furthermore, the coexistence of 7ND and CCR2 could be detected in the diseased kidneys (Figure 1, d through f). These results suggested that 7ND protein was actually in the diseased kidneys and may directly affect the CCR2 signaling. Figure 1. Detection of 7ND protein with FLAG in sera and diseased kidneys. (a) 7ND protein with FLAG was detected in the sera at 7 and 14 d after the induction of in a murine UUO model; 7ND was not detected in control mice. (b) 7ND protein in sera was observed by ELISA during experimental periods. (c) 7ND protein could be detected in diseased kidneys in 7ND-treated mice at 14 d. In addition, 7ND protein with FLAG was visualized with Cy3 and the CCR2 staining with FITC (d through f). In 7ND-treated mice, 7ND-positive (d) and CCR2-positive (f) cells were detected in diseased kidneys at 14 d. Some of interstitial CCR2-positive cells were also positive for 7ND (e). To determine the effects of MCP-1/CCR2 signaling on renal fibrosis, the inhibitory effects of 7ND treatment were evaluated. Progressive renal fibrosis was observed in the diseased kidneys in untreated mice (Figure 2, a and c). 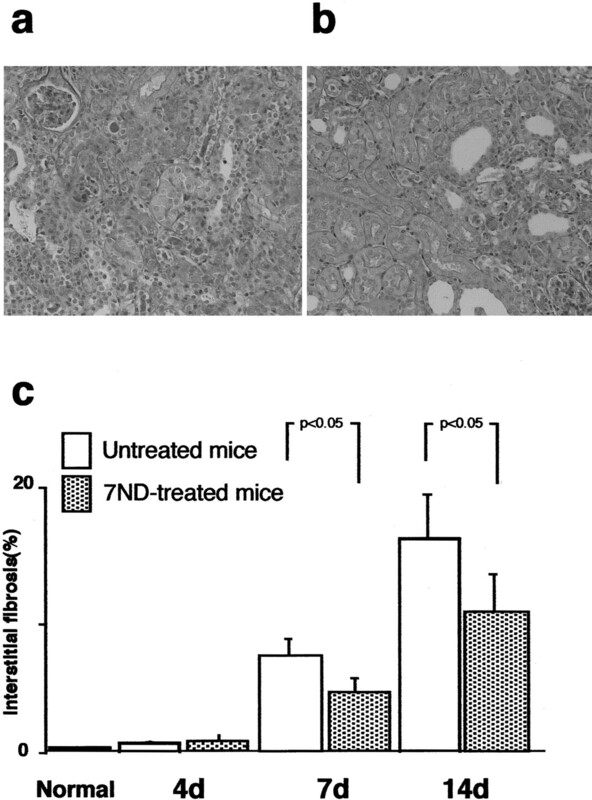 In contrast, mean interstitial fibrosis, expressed as percentage of the field, was reduced via 7ND treatment relative to untreated mice (Figure 2, b and c). However, 7ND treatment did not return interstitial fibrosis to normal levels as observed in sham-operated mice (data not shown) or normal control mice (Figure 2, b and c). In addition, HP amount was evaluated for a more quantitative measurement to evaluate tissue collagen content. Similar to the computer-assisted measurement of renal fibrotic area, total tissue collagen content was significantly reduced by 7ND treatment (Figure 3). Figure 2. 7ND treatment ameliorated renal fibrosis. (a) Progressive interstitial lesions exhibited cell infiltration and interstitial fibrosis in untreated mice at day 14. Original magnification, ×200. (b) 7ND treatment ameliorated renal pathology. A representative renal pathology at day 14 is shown. Original magnification, ×200. (c) Interstitial fibrosis was reduced by 7ND treatment. Figure 3. 7ND treatment reduced tissue collagen content. Total tissue collagen content, measured by hydroxyproline amounts, was significantly reduced by 7ND treatment. Furthermore, ureteral ligation enhanced type I collagen-positive area (Figure 4, a and b) as well as upregulation of type I collagen mRNA in the diseased kidneys at 14 d, which participate in the progression of renal fibrosis (Figure 4c). The upregulated mRNA expression of type I collagen in diseased kidneys was reduced by 7ND treatment, followed by the subsequent decrease in type I collagen deposition (Figure 4, b and c). In contrast, type I collagen detected by immunohistochemical analysis or RT-PCR was faintly detected in normal kidneys (Figure 4, b and c). Therefore, the inhibition of MCP-1/CCR2 signaling likely reduced renal fibrosis by partly resulting in a reduction in type I collagen synthesis. Figure 4. Type I collagen expression was decreased by 7ND treatment. 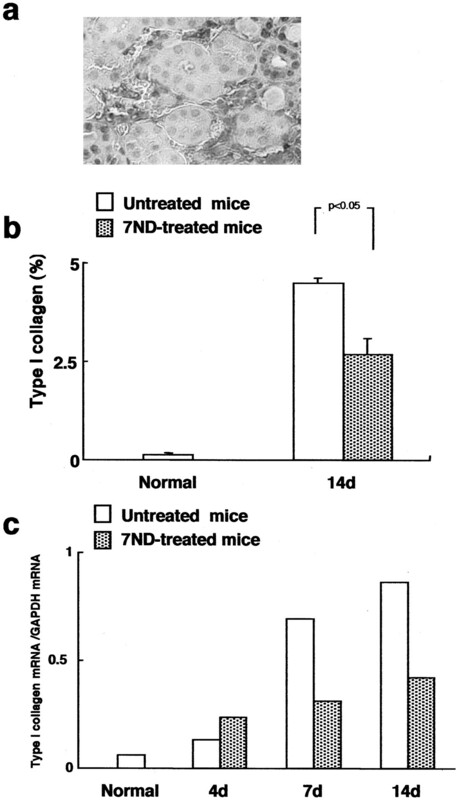 Type I collagen expression was upregulated in untreated mice at 14 d (a), which was reduced in the interstitium in mice treated with 7ND compared with that of untreated mice (b). Original magnification, ×400. The upregulated mRNA expression of type I collagen in diseased kidneys was reduced by CCR2 blocking, whereas mRNA expression of type I collagen was faintly detected in normal kidneys (c). The presence of TGF-β1 protein, evaluated immunohistochemically in diseased kidneys, was detected mainly in tubular epithelial cells in untreated mice 14 d after ureteral ligation (Figure 5, a and b), whereas TGF-β1 protein was faintly detected in sham-operated or normal mice (Figure 5b). 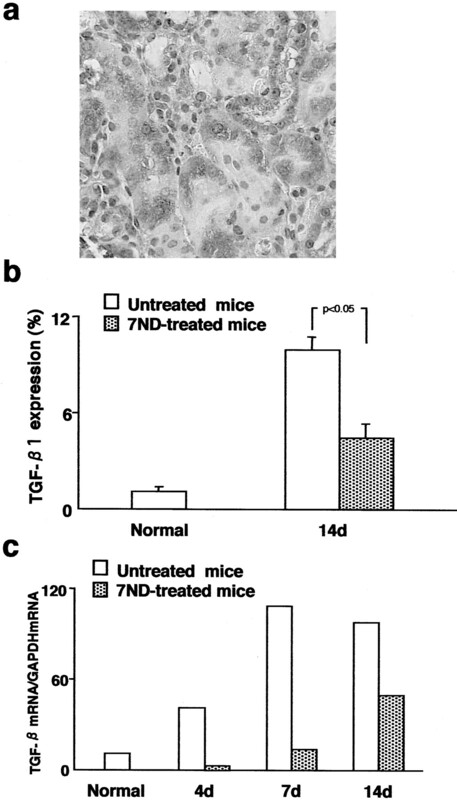 Compared with untreated mice, the area of TGF-β1-positive cells was reduced in 7ND gene transferred mice (Figure 5b). Figure 5. Decreased renal TGF-β expression by 7ND treatment. (a) Upregulation of TGF-β1 protein was detected mainly in tubular epithelial cells in diseased kidneys in untreated mice at 14 d. Original magnification, ×400. 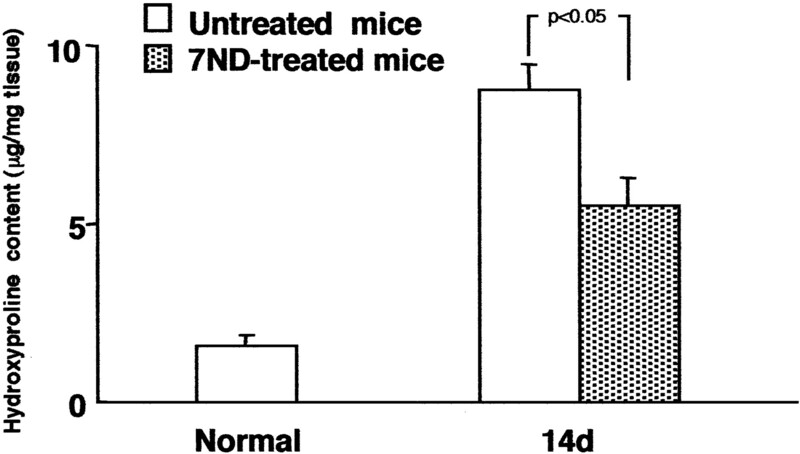 In contrast, TGF-β1 protein was reduced in 7ND-treated mice (b). The percentage of the TGF-β1-positive area is shown. (c) Transcripts of TGF-β were faintly detected in normal kidneys by real-time RT-PCR. In contrast, transcripts of TGF-β in diseased kidneys increased in untreated mice. The levels of these transcripts were reduced by MCP-1/CCR2 blockade. Transcripts of TGF-β1 were faintly detected in normal (Figure 5c) or sham-operated kidneys (data not shown) by real-time RT-PCR. In contrast, transcripts of TGF-β1 in diseased kidneys in untreated mice upregulated, whereas 7ND treatment reduced the upregulation of renal TGF-β1 transcripts (Figure 5c). Thus, these findings suggested that postnatal inhibition of MCP-1/CCR2 signaling via 7ND downregulated the expression of TGF-β1, which in turn may decrease in fibrogenesis in the interstitium. Progressive interstitial lesions induced by ureteral ligation in a UUO model prohibited cell infiltration into the diseased interstitium as well as renal fibrosis. Furthermore, F4/80-positive macrophages infiltrated mainly in the outer medulla in a UUO model. The infiltration of F4/80-positive macrophages was reduced by 7ND treatment (Figure 6d). To determine the presence of CCR2 on F4/80-positive cells, a dual staining was performed. Most infiltrating F4/80-positive cells were also positive for CCR2, which were reduced by gene transfer of 7ND gene (Figure 6, a through c). Therefore, inhibitory effects of MCP-1/CCR2 signaling by 7ND treatment predominantly reduced CCR2-positive macrophages, leading to the decrease in cell infiltration. Figure 6. Decrease in CCR2-positive F4/80 macrophage infiltration by MCP-1/CCR2 inhibition. 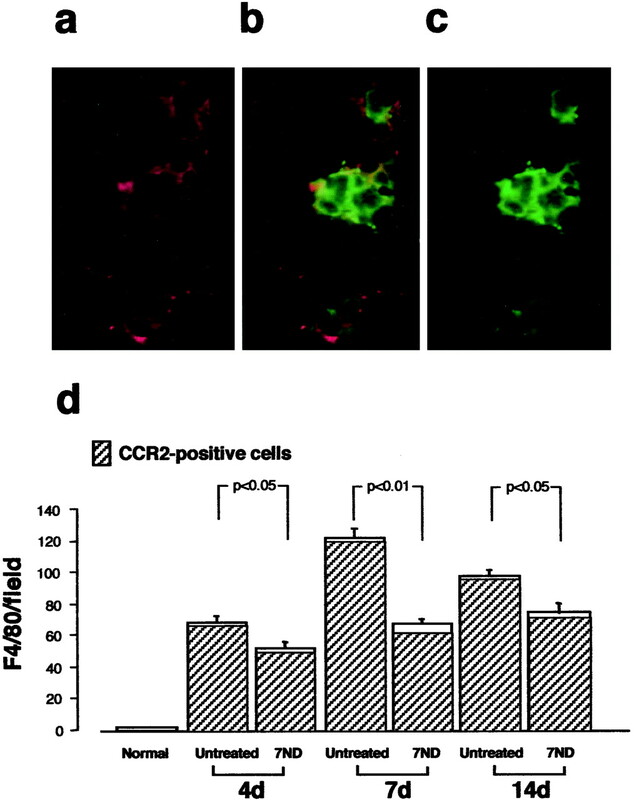 F4/80-positive cells were visualized with Cy3 (a) and the CCR2 staining with FITC (c). Most of infiltrated F4/80-positive cells were also positive for CCR2 (b). A considerable number of F4/80-positive macrophages, most of which were positive for CCR2 infiltrated into interstitium by day 4, reaching a peak on day 7 (d). F4/80-positive macrophages were decreased with 7ND treatment at each time point examined. Hatched bars indicate the numbers of dual positive cells for F4/80 and CCR2. The expression of MCP-1 was faintly detected from normal kidneys (Figure 7, b and c). Renal MCP-1 in the diseased kidneys, mainly detected in tubular epithelia cells and infiltrates (Figure 7a), was increased in untreated mice detected by protein expression (Figure 7b) and by real time RT-PCR (Figure 7c). In contrast, the levels of MCP-1 transcripts and protein were decreased in mice with 7ND treatment (Figure 7, b and c). Thus, 7ND treatment ameliorated the macrophage infiltration, possibly through the decrease in MCP-1 expression in the diseased kidneys. Figure 7. Reduced expression of renal MCP-1 by MCP-1/CCR2 inhibition. MCP-1 protein, mainly detected in tubular epithelial cells and infiltrates (a), was reduced in the interstitium in mice treated with 7ND compared with that of untreated mice (b). (c) Transcripts of MCP-1 were faintly detected from normal kidneys by real-time RT-PCR. In contrast, upregulated transcripts of MCP-1 in diseased kidneys in untreated mice were reduced by MCP-1/CCR2 blockade. Original magnification, ×400. In this study, we explored to determine the inhibitory effects of MCP-1/CCR2 signaling via 7ND treatment on renal fibrosis. 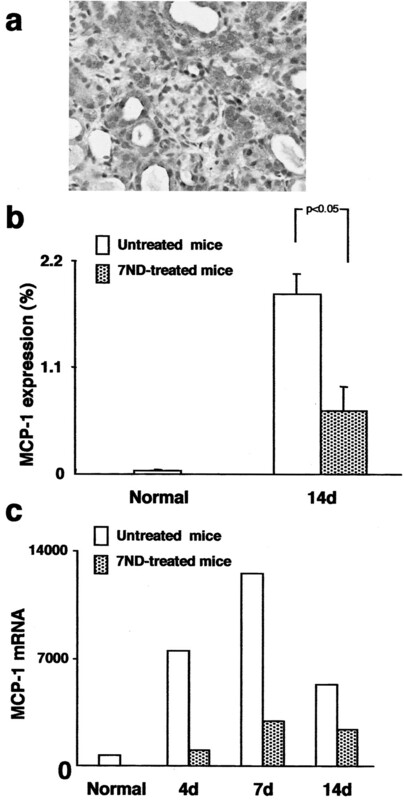 The study presented here demonstrated that: (1) 7ND treatment, which specifically inhibits MCP-1/CCR2 signaling, attenuated the cell infiltration, especially macrophage infiltration, which possibly resulted from the reduction in the MCP-1 expression; and (2) 7ND treatment ameliorated progressive renal fibrosis as well as type I collagen deposition, concomitantly with the decrease in renal TGF-β1 expression. Thus, the study presented here suggested that the inhibition of MCP-1/CCR2 signaling via gene delivery of 7ND is the promising therapeutic approach against progressive renal fibrosis. Renal fibrosis, the characteristic to progressive renal diseases, is the determinant of the prognosis of renal diseases with any etiologies. Therefore, to establish the therapeutic strategies for renal fibrosis is of importance. We found that the blockade of MCP-1/CCR2 signaling reduced renal interstitial fibrosis, with the concomitant decrease in the expression of MCP-1, TGF-β and type I collagen mRNAs. Our findings are consistent with previous reports that CCR2 signaling via MCP-1 plays a key role in human and experimental renal damage, especially in the interstitium (7–9, 22⇓⇓⇓). It is worth noting that MCP-1 deficiency prevented interstitial injury, but not glomerular lesions in a murine experimental model of glomerulonephritis induced by anti-glomerular basement membrane antibodies (23). Recently, an intrinsic regulatory loop in which MCP-1 stimulated TGF-β production by resident glomerular cells has been suggested in the absence of infiltrating immune competent cells (24). Increased renal expression of TGF-β both in mRNA and protein level was detected in isolated rat kidneys, perfused with a polyclonal anti-thymocyte-1 antiserum and rat serum; this effect was attenuated by coperfusion with a neutralizing anti-MCP-1 antibody but was partly mimicked by perfusion with recombinant MCP-1 protein (24). These results suggest an additional role for MCP-1 in fibrotic renal diseases, possibly by interacting with TGF-β. These findings, combined with our study presented here, suggest that diminished CCR2 signaling may downregulate TGF-β expression, thereby attenuating progressive fibrosis in the diseased kidney. Thus, the inhibition of MCP-1/CCR2 signaling is a possible therapeutic strategy for progressive renal fibrosis (25). Progressive fibrosis is a common pathologic finding in various organs, resulting in organ failure. MCP-1/CCR2 signaling is reported to be involved in the pathogenesis of progressive fibrosis in lungs (10,12⇓). Alveolar epithelial cells (AEC) from CCR2 deficient mice suppress fibroblast proliferation more than AEC from CCR2 intact mice (26), which provides a key to the protection from pulmonary fibrosis in CCR2 deficient mice. Furthermore, recent studies also suggest the critical role of MCP-1/CCR2 signaling as therapeutic strategy in atherosclerosis and vascular restenotic changes (neointimal hyperplasia) (27,28⇓). Thus, taken together, blockade of CCR2 signaling via MCP-1 is therapeutically promising in promulgating progressive fibrosis beyond the regulation of macrophage chemotaxis and activation. 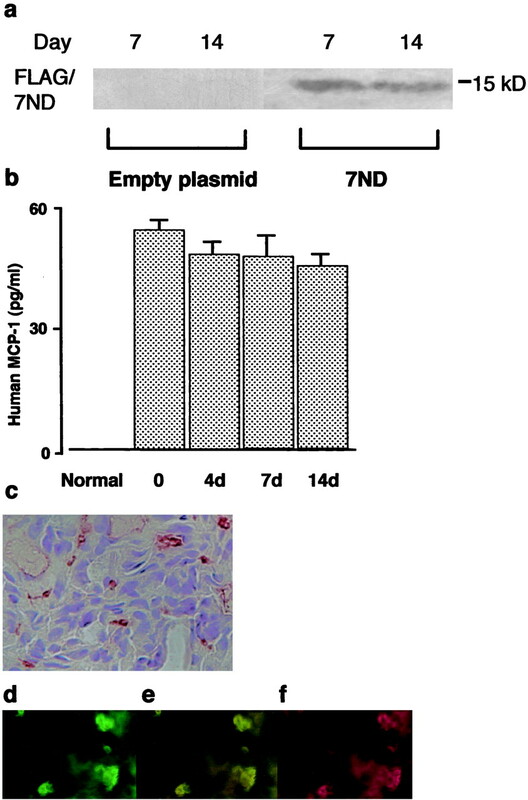 We found that gene delivery of 7ND via electroporation into femoral muscle was able to quench cell infiltration and advanced interstitial damage in the remote organ, kidneys. 7ND, presumed to form inactive oligomers with wild-type MCP-1, reduces monocyte chemotaxis via binding to CCR2 and acts as a dominant-negative inhibitor in vitro (29). Previous studies have clearly showed the inhibitory effects of 7ND on vascular remodeling and atherosclerosis in vivo (15,16⇓). More recently, we have reported that 7ND treatment was capable of ameliorating the ischemia-reperfusion injury, which resulted from the upregulation of the MCP-1/CCR2 signaling (18). Therefore, these studies, together with our present data, demonstrate the efficiency and efficacy of 7ND as a therapeutic tool to inhibit MCP-1/CCR2 signaling. We expect that this novel therapeutic approach using 7ND will have a great effect on the treatment of various inflammatory diseases in which MCP-1/CCR2 signaling plays a pivotal role. Macrophages may have both effects on renal damage, e.g., beneficial effects to prevent renal damage and harmful effects to accelerate renal damage. Macrophages would function to scavenge profibrotic molecules through their scavenger receptor(s), leading to preserve the renal parenchymal architecture (30,31⇓). In this study, we investigated the role of MCP-1/CCR2, which may affect the macrophage function and/or the other renal cells than macrophages in the pathogenesis of renal fibrosis. First, human CD14-positive monocytes could express TGF-β according to MCP-1 stimulation, which may, at least in part, imply the direct involvement of MCP-1/CCR2 in the pathogenesis of fibrosis (manuscript in preparation). In addition, it is reported that CCR2 could be expressed on other cells, including fibroblasts, than macrophages. MCP-1-dependent synthesis of TGF-β and procollagen in fibroblasts is also noted (32). Even though it remains to determine whether CCR2 is expressed on renal resident cells including renal fibroblasts, it might be reasonable to speculate that MCP-1/CCR2 inhibition might be associated with reduced profibrotic molecules from renal fibroblasts. Finally, the interaction between macrophages and renal epithelial cells would be important. It was reported that MCP-1/CCR2-dependent activation of NF-κB and AP-1 in tubular epithelial cells might amplify the local inflammation (33). The reduction of MCP-1 expression via MCP-1/CCR2 inhibition in this study, therefore, may in turn quench the inflammation of renal epithelial cells, thereby contributing to anti-fibrotic effects. This may be supported by our findings of reduced expression of TGF-β1 in tubular epithelial cells. Therefore, taken all together, the inhibition of MCP-1/CCR2 may have anti-fibrotic effects of macrophages and/or other renal cells, resulting in reduced renal fibrosis. The expression of MCP-1 was reduced via MCP-1/CCR2 blockade. This reduction of MCP-1 may be proportional to the decline in macrophage infiltration in the diseased kidneys. In addition, CCR2 signaling is an important factor for macrophage activation as well as infiltration. Activated macrophages by CCR2 signaling produce cytokines and chemokines including MCP-1, which in turn stimulate renal resident cells such as renal tubular epithelial cells or endothelial cells to produce cytokines and chemokines. Supporting this knowledge, it was recently reported that MCP-1 activates AP-1 and NF-κB in tubular epithelial cells (33), which are responsible for the production of IL-6 and ICAM-1. Moreover, AP-1 and NF-κB are critical for production of MCP-1 in tubular epithelial cells (34). These data suggested that MCP-1/CCR2-dependent activation of NF-κB and AP-1 might amplify the local inflammation of the diseased kidneys including MCP-1 production itself. Furthermore, human CD14-positive monocytes, as mentioned above, could upregulate MCP-1 expression dependent on MCP-1 stimulation, which is inhibited by the CCR2 blockade. Therefore, MCP-1/CCR2 inhibition may directly or indirectly lead to the reduced MCP-1 expression in diseased kidneys. In conclusion, we have determined that the MCP-1/CCR2 signaling is responsible for renal fibrosis and that the inhibition of MCP-1/CCR2 signaling via 7ND is an appealing therapeutic strategy for combating progressive renal fibrosis. We thank Drs. Chu Kataoka (Kyushu University), Mariko Akiyama, and Hui Wang (Kanazawa University) for excellent advice. T.W. is a recipient of a Grant-in-Aid (No. 14571019) from the Ministry of Education, Science, Sports, and Culture in Japan. This work is supported in part by a Grant-in-Aid from the Ministry of Health, Labor, and Welfare of Japan.